I’m so sorry to keep everyone hanging on the storyline! I have the next 20 or so pages completely drawn, but unfortunately the last several months have been consumed with freelance work leaving me with no time to color and finish them. 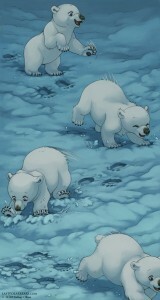 Freelance work has been good for keeping a roof over my head, but not so good for our polar bear family’s adventure. Speaking of keeping a roof over my head, the owner of the place I’m renting decided to unexpectedly sell her condo, so I’ve also had to put a lot of my energy into preparing to move. I’m not sure when the next update will be, but hopefully I’ll be able to start fitting polar bear pages back into my schedule soon. As soon as I’m settled into a new place and finished with the freelance project, The Last of the Polar Bears will be my full time focus again, and I am looking forward to it. Every day, I read sad news about the problems polar bears are facing , so I feel it’s more important than ever to tell this story. In the meantime… Thank you so much for your continuing support and patience! Thank you for your information. It’s not too easy times, and yours are difiicult as well, I am afraid. All the best for your near future. Feel at home soon again in your new apartment. Don’t fee under presure, anyway, I am looking forward to the pleasure of reading more about YOUR “Last Polar Bears”. So good to hear from you, even with less than stellar news about LotPB. I was getting a little worried about you, after such a long absence. Take your time, get settled, keep the income coming, and we’ll be waiting for you. a brief update to let us know you’re well and still around will be appreciated by all your fans.